Immediately after the start of round five your correspondent interviewed Alexander Khalifman, who is coaching Rauf Mamedov here. - Alexander Valeryevich, how do you assess the players’ performance at this stage of the event? Who has shined, and vice versa? - This time it is not as simple as that: as far as I see, the players coming here from the Candidates tournament have not yet recovered to a full extent. There are those who say: not only have these players had twenty rest days, they are professionals after all... It is more that that, however. The Candidates tournament is, first of all, a tough psychological challenge, and while the class is being demonstrated, there is sometimes not enough firepower to deliver the final blow. It explains the rate of decisive games we have seen so far. - Still, the majority of players have had nothing to do with the Candidates. - There are three players coming from the European Championship. Even if this event belongs to an entirely different league, the European Championship is nonetheless known to be a Swiss tournament that leaves you completely exhausted. Each player’s schedule is packed to capacity. On the other hand, there are no overly boring and peaceful games, it is just that certain players narrowly miss on their opportunities. Therefore, I will refrain from accusing anyone. What matters to me is that my trainee is up to the occasion, and I am quite unwilling pass judgment on others. - Which probably means that you are pleased with Rauf’s progress, right? How much has he gained lately? - He has gained significantly during the last year. It's hard for me to say as to what was going on before because Rauf is a very spontaneous and unpredictable person. However, as of lately his attitude has drastically shifted for the better. He has finally cleared the 2700 barrier, something he was expected to do some five or seven years ago based on the amount of talent and whatever else given him from above. Let us hope he will manage to keep up this level, which he is likely to do judging by what we see him do at present. This said, he lacks experience of playing in similar tournaments, so that some shyness and nervousness manifest themselves from time to time. However, this is not especially felt over the chessboard; his current results is OK as he has been Black in three out of four games. All games have been drawn in our case, which is not a reason to be overly optimistic, but I think everything is fine. This is quite a satisfactory result. - Meanwhile, the leader Topalov is a rare tournament guest; he stood better in two games, but failed to finish off his opponents, winning at last in round four against Shakhriyar Mamedyarov. Is it mayhaps due to his infrequent tournament appearances after all? - I have noted the pros of it myself in that when you play rarely you start missing chess. It's obvious, of course, that Veselin has been working much less on chess as of recently. However, his class makes itself known. His propensity towards active play and calculating capabilities are as good as ever. In spite of the above said, he has let go of two wins already. He dictated the course of battles against Giri and Ding Liren, but lacked consistency somewhere along the way. It is hard to say what befell Shakhriyar, though. He is largely responsible for it himself for having done so much in terms of helping his opponent win the game. It was a roller coaster game, and when it came to the decisive moment Shakhriyar got carried away somewhat. It happens. - If everyone is that much tired by now, can you say the trend is likely to continue along same lines in the rounds to come? Or, will it rather be that the second half of the tournament is going to produce more decisive results once fatigue starts creeping into the players’ games? – I believe this fatigue is more of psychological than of physical nature. There will be no extravaganza, I'm almost confident in that, but there will definitely be more decisive games. That’s for sure. - What is your take on the openings seen in round five? - Carlsen has again come up with some new methods of initiating fight in the Sicilian defense. It's always interesting to keep track of. The games Ding Liren - Radjabov and Mamedyarov - Giri saw a line of the queen gambit declined that has been tested far and wide. Let us see who is going to surprise who, but the line is known to be tranquil in general. Nevertheless, I think Shakhriyar has something specific going into this line, which may prove to be of great interest. In Navara-Topalov White opted for the Reti Opening, which is a way of catching your opponent off balance nowadays. I do not feel like discussing the opening in Rauf’s game, suffice it to say that the line is rather combative. It is too early to say anything more specific right now. The only game that is definitely going to be exciting is Carlsen – Wojtaszek. Carlsen – Wojtaszek was a decisive game indeed. The champion has delivered an exciting battle, just as he promised beforehand. Magnus got an opening edge in the 4.Qxd4 Sicilian, but refrained from a typical strike Nd5 as not seeing any clear-cut winning path over the board. The Norwegian decided against forcing events in this position in favor of 17. g4, but during the press conference he showed the line 17. Nd5 exd5 18. exd5 Nd8 (18... Nb8 19. Bd3 Rh5 20. Rxe7+ Qxe7 21. Re1) 19. Bg4 Kf8 20. Re2, adding that this was perhaps the way to go. 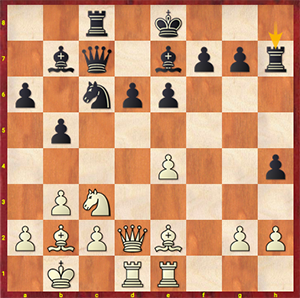 25…Rc5 enabled White to carry out 26. e5! Instead, Black should have opted for 25…e5 himself. 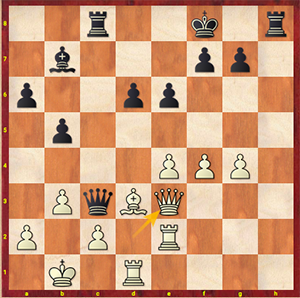 A move late the Polish grandmaster blundered altogether: 26…dxe5 27. fxe5 Rh1? 28. Rxh1 Bxh1 29. Rh2 Rxe5 30. Rh8+ Ke7 31. Qa7+. Black resigns. A second win in a row has been scored by Veselin Topalov, who was patient in hunkering down as Black for the most part of the game against David Navara and then carrying out a positional pawn sacrifice to obtain decent compensation in the form of two bishops. In Topalov's opinion, the opponent followed up by committing many mistakes, but even in a bad position arising after move 40 White was still not entirely devoid of practical chances." Veselin Topalov: “I am not convinced that my performance was perfect in this position. It looks like he got upset over overlooking my last move after 42. Qc4 Qxc4 43. Bxc4Bc2. More stubborn is 42. Qd2 Qxd2 43. Nxd2 Bb4 44. Nc4 Bb5 45. e5 Bxc4 46. 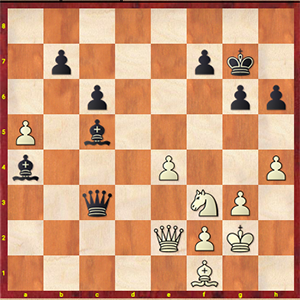 Bxc4 Bxa4 – this opposite-colored bishop ending is less unpleasant than a knight vs bishop one seen in the game. Then White blundered with 44. Nd2? The grandmaster argued that White is still in the game after either 44. e5 or 45. g4. The way it happened, David found himself helpless against the queenside onslaught of the black pawns. Sergey Karjakin vs Rauf Mamedov lasted about an hour. The Russian said that he chose the Sicilian defense as a fighting vehicle, but there arose a Moscow line well familiar to both players. The forced line resulted in the majority of pieces traded off the board, and the game ended in a draw in a minor piece endgame. Sergey joked about toying with the idea of following in Magnus’s recent footsteps by skipping the press conference following his draw with Rauf. Mamedyarov - Giri was a relatively calm draw. Shakhriyar acknowledged his inability to recall his home prep during the game in a “played to death” line of the Queen’s Gambit, which left him to his own devices. The setup was so solid that breaking through for either side was next to impossible. A logical outcome was a draw was agreed immediately after move 40. Shakhriyar shared about having analyzed the game with Topalov and arriving at a clear-cut conclusion that he was winning, also acknowledging to being aware of the correct continuation over the board but never making the move. It has upset him big time. He joked that when losing a game he usually regrets the time spent on playing backgammon instead of studying chess. Since his position in round four was winning, he had nothing to complain about. Anish Giri was another player claiming to have a difficult tournament so far, his play not going the way he would like to. Therefore, he is going to spend his rest day taking a walk and relaxing. “It is not about tourism, but Erwin and I know where to go in Shamkir. I need to have my batteries recharged,” grandmaster said. Teimour Radjabov got an excellent position as Black against Ding Liren. The Azeri grandmaster launched a queenside play in the Queen’s Gambit and got an edge, but a tenacious Chinaman kept his position together. Teimour Radjabov: “In general, my position was a good one, but I failed to bring the point home. I did not see a clear win, but maybe I should have captured the a3-pawn with my rook. On the other hand, they say it amounts to nothing. While it was probably a good practical chance, I disliked the pin along the b-file as exposing me to possible errors, and I was rather keen on playing positional chess. It was vice versa with Giri, by the way: I grabbed everything coming my way, but it was only a draw in the end. All in all, it was necessary to find the golden mean. April 24 is a scheduled rest day at the tournament. Simuls and football matches are on the agenda. I think the evening will be devoted to watching the Champions League’s semi-final. Radjabov - Wojtaszek, Karjakin - Carlsen, Topalov - Mamedov, Geary - Navara, Ding Liren - Mamedyarov. Let us see how hot the battle of two Ks is going to be.